The above ingredients are the base of most Thai curry pastes. A large number of Thai dishes include one of many curry pastes, the most popular being the green, red and masaman curry pastes. The latter originated from southern Thailand, hence it’s Malay influence. When you visit markets in Thailand, you will come across stalls, selling these aromatic and colorful curry pastes. These pastes can be purchased in grams, and taste much better than those sold in bottles. Besides, they do not contain any preservatives. After tasting the fresh curry pastes, I make my own. If you follow the instructions and have all the ingredients required, it’s quite easy. I store the pastes in the fridge for 2-3 days, but if it’s a large quantity, I freeze them for up to 2 months. They best way to chop up and grind all the ingredients is by using a pestle and mortar; when you pound the ingredients together, all the oils tend to come out, which makes the quality of the paste excellent. Since I make these pastes quite often, I use my electric grinder. One of my favorite curry pastes is the red curry paste. This tastes great with fish, chicken or an assortment of seafood, such as prawn and squid. This paste will suffice for 2-3 meals. 1. Dry-roast the shallots and garlic until they have blistered and softened. 2. Then wrap the belacan in a piece of foil, and roast it on a low fire for around 1 minute on each side. 3. 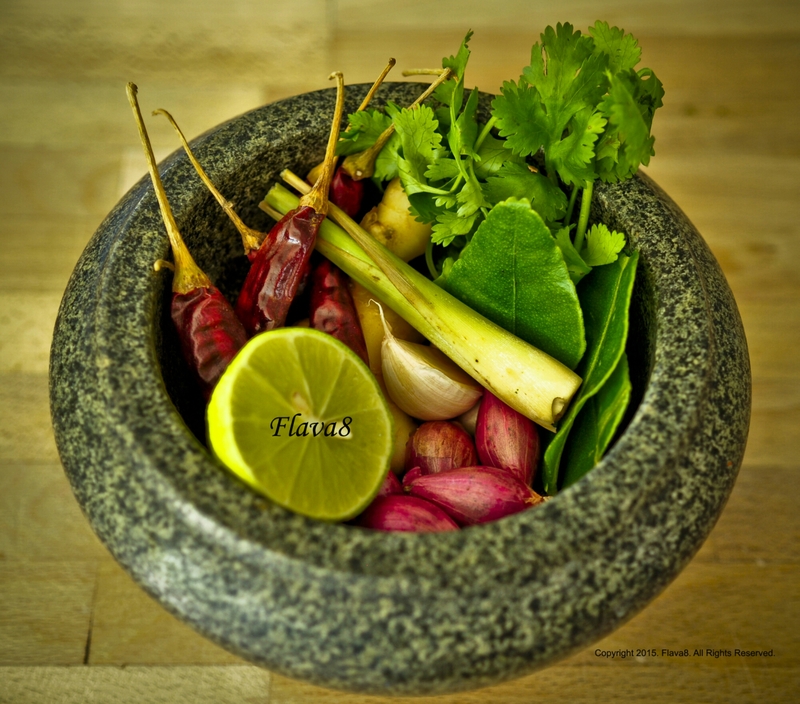 Chop the lemongrass, lime leaves, galangal along with all of the other ingredients, and pulse until smooth. 4. Put a little vegetable oil into a pan, and fry the paste on low heat for about 8-10 minutes. Once the paste is cooked, the oil will exude. In the future I will post a recipe for the prawn red curry.